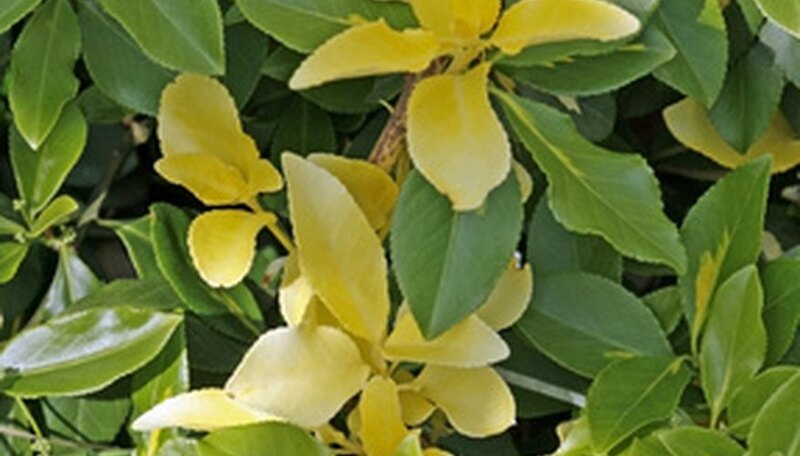 There are more than 100 kinds of euonymus shrubs available, including variegated, evergreen, golden-tipped and even vining cultivars. All euonymus prefer light shade or full sun, with fertile, well-drained soil. They are easy to grow and maintain, but there are some diseases that will affect them. The soil bacterium Agrobacterium tumefaciens causes crown gall. Corky, irregular galls (abnormal tissue growths up to several inches in diameter) will appear at the plant's base, stems and roots. The galls weaken the plant, slowing its growth, turning the leaves yellow and cutting off the flow of water and nutrients to the top of the plant. Infected plants cannot be cured, but they may survive for many years. Remove and destroy stems below the galls, cleaning your shears with rubbing alcohol after each cut. If a shrub is severely infected, it should be destroyed. Powdery mildew is caused by the fungus Oidium euonymi-japonici. Euonymus shrubs that are infected have flat, whitish-gray growths on their leaves' upper surfaces. The foliage may turn slightly yellow and drop; young leaves may become curled and scarred. Prune and destroy heavily diseased branches. Keep powdery mildew at bay by removing and destroying fallen infected leaves, planting in a sunny area, not crowding plants and watering at the soil line instead of overhead. Fungicides will protect the plant from further infection but will not remove the fungal growth from infected leaves. Two fungi, Cercospora detructiva and C. euonymi, cause leaf spot, misshapen brown spots on euonymus leaves. The spots, which range in size up to 1/2 inch in diameter, often merge and take over whole leaves. The large spots have grayish-tan centers. The disease is rarely fatal to euonymus. Treatment includes gathering and destroying all fallen leaves, then spraying infected plants with the fungicide thiophanate-methyl (Thiomyl). Scab is caused by the fungus Elsinoe euonymi-japonici. It causes small, grayish-white spots with a red-orange margin on euonymus leaves. As the spots grow together, the centers sometimes fall out, leaving a hole in the leaf. The scab also affects the stems, leaving similar but darker spots. According to the NC State University Extension, no chemicals control scab. While it causes distorted growth and unattractive leaves, it is not fatal. The fungus Colletotrichum causes anthracnose. Infected euonymus leaves and twigs will have small, brown spots with light centers. The fungus also leaves tiny cracks in the leaf spots. Anthracnose can cause considerable defoliation. The disease is most commonly found during cool, wet springs. Variegated varieties of euonymus tend to be more vulnerable to anthracnose. Control anthracnose by cleaning up and destroying fallen leaves, opening up the leaf canopy to improve air circulation, improving soil fertility and using copper or sulfur fungicides.